Any tourist or expat who loves Russia wants to have a piece of it at home on the mantelpiece. Something typically Russian and exotic that screams: "I went to Russia!" In the country itself, the tradition of fairs and markets is still very much alive. Anyone who wants to can go on a real Russian-style shopping trip. A fair in Russia is an open-air market, although it could also be described as a bazaar. It comes with all the usual trappings: noise, shouting, haggling to get two-thirds off the price of a product that is at least five times overpriced, ever-present pickpockets, and the same thrill of the chase that causes Europeans to snap up carpets in Tunisia and matryoshka dolls in Moscow. Buying Russian souvenirs anywhere else is pointless. This leaves only two questions: What should you buy in Russia, and where? Looking for interesting antiques, unique drinks, and peculiarly Russian food? How about some excellent warm clothing for those cold winter nights? Russians know a thing or two about that. Many tourists from Northern countries come here especially to seek out fur hats with earflaps or fur coats. Russia is particularly famous for its down shawls from Orenburg in the southern Urals. They are incredibly warm, yet thin and lightweight. Orenburg shawls bear all the characteristics of traditional folk handicraft. In Russia, colorful woolen and cotton shawls with traditional Russian patterns known as khokhloma are becoming increasingly popular. Young girls carefully select shawls to match their eyes and hair and to wear them with fur coats. It became fashionable just a year ago, and it really does look beautiful. European tourists sometimes cling to old preconceptions that, supposedly, "only grannies wear such scarves." 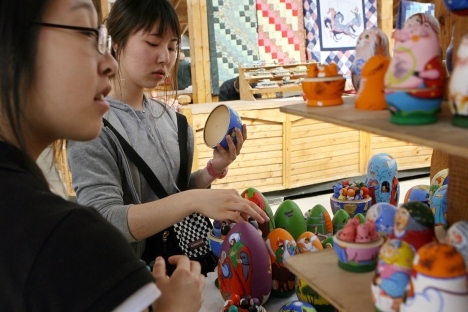 Besides clothing, Russian fairs teem with matryoshkas and other wooden objects. Such souvenirs not only decorate shelves, but can also be put to good use in the kitchen: Russian-style spoons, plates, or spatulas make a great gift. Some tourists admit to occasionally scouring Russian markets for old Soviet antiques. Dulled World War II medals, military clothing, badges, books — these are all of wild interest to collectors. It should be noted that such medals and decorations were awarded to people for heroism on the battlefield, and then sold to dealers out of extreme poverty. Selling and buying state awards is illegal, and special permission must be obtained before trying to take them out of the country. So be forewarned. Utensils occupy a special place among Russian souvenirs. For example, the rare samovar is still a symbol of Russian life, despite having been replaced by the ubiquitous kettle. From time to time, visitors might still catch a glimpse of a large and beautiful samovar on a dining table. The famous dishware from the town of Gzhel is also a trademark of Russia, renowned for its intricate patterns and colors. Gzhel is an ancient center of porcelain, earthenware, and pottery production. And, of course, many people want to indulge themselves and their friends with good old-fashioned pancakes, cakes, and kvass. Moscow periodically hosts honey fairs, with different varieties brought in from all over Russia. Fair-goers can spend all day tasting honey. At such events, tourists can also have a sip of a light alcoholic drink known as medovukha, or sweet mead. Where should tourists go to buy souvenirs in Moscow? This is the most banal option, perfect for lazybones. On exiting Teatralnaya metro station, you will see a series of tents with the usual suspects: dolls, hats, scarves. Pros: you do not have far to go if you are staying in the center, and you will be able to visit the Kremlin and Red Square at the same time. Cons: everything is overpriced and rather clichéd. Strolling along this historic pedestrian street at the heart of Moscow, you can hear live music, buy your own portrait, and pick up souvenirs or even a tattoo. Pros: the street itself is of historical interest. There is quite a wide variety of souvenirs and lots of pictures. Cons: the prices are slightly inflated. This famous tourist attraction is a kind of observation deck from which to view Moscow. There is never a shortage of stalls with souvenirs. The choice, however, is not large, even though it is somewhat more varied than the selection on Red Square. Pros: at Sparrow Hills you can take a ride up the chairlift or a boat trip from one of the piers; in good weather, you can see almost all of Moscow from the observation point. Cons: a rather limited selection and generally very windy conditions, even in summer. This is perhaps the most famous and largest market in the area, located at Partizanskaya metro station to the east of Moscow. Here you can find souvenirs galore, including giant matryoshkas and numerous Soviet antiques and paintings. Seasoned tourists recommend going deep into the belly of the market, where things are cheaper and haggling is easier. Pros: a vast selection and located near Izmailovo Kremlin. Cons: quite far from the center of the center.